RecyclePoints harvests recyclables directly from post-consumers thus generates very neat materials that have not been co-mingled with dirt. This adds huge value in the recycling process as it reduces the cost of washing and assures better quality material free from contaminants. The collected recyclables are further processed at our Collection and Sorting HUBs (CoSoHUB) and thereafter sold to manufacturing/recycling plants who use the items as raw materials for the production of a wide range of items, including but not limited to polyester fiber, carpets, hangers, pegs, aluminum ingots, craft papers for making carton etc. iRecycle Network – targeted at individuals. Recyclable materials are exchanged for household items. WastePicker Initiative – targeted at individuals. Recyclable materials are exchanged for cash. Corporate Recycling – targeted at corporate establishments. Schools Recycling – targeted at academic establishments. Subscribers under our iRecycle Program exchange their recyclable items for “Points” which accumulates over time. At the point of collection/drop-off, the recyclable items are counted and points earned according to the chart below. 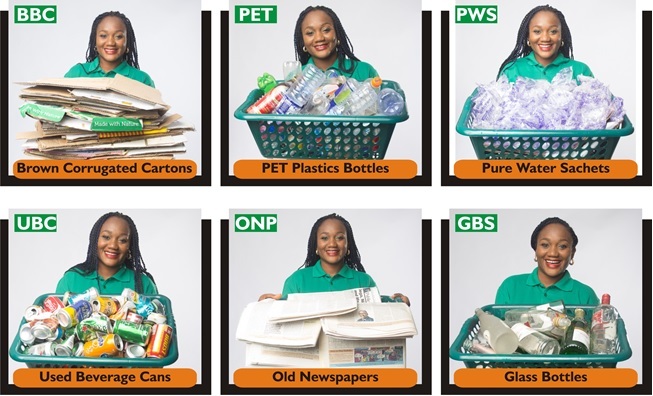 The subscribers then use the points to redeem valuable household items from our iRecycle Store. To sign up for our iRecycle Program click here. Under our WastePickers Inititative (WPI), subscribers exchange their recyclable items for cash rewards, calculated according to the weight of materials being recycled. Subscribers are to bring their recyclable items to any of our hubs closest to them (see list below). The items are weighed and the value of items ascertained from the measured weight. Each type of material recycled have a price per kilogram (contact any of our hubs for the current price). The cash rewards are paid into subscribers bank account (account can be opened instantly in any of our hubs). To signup for our WPI program, please visit any of our hubs closest to you. See list below.